In case you wondering; YES, the WWE is still releasing print-and-paper books. In fact, their latest offering will be the soon-to-be-a-classic The Book Of Booty: Shake It. Love It. Never Be It. I’m ALMOST certain that just from the title alone, that this latest literary project will be coming from the new longest-reigning tag team champs in history, The New Day (and yes, I know they lost the titles to Sheamus and Cesaro this past Monday; the record still stands). This book, being co-written by members Xavier Woods, Big E Langston and Kofi Kingston, is currently on Amazon for pre-order, and the listing features their real names, so YOU KNOW it’s a real thing about to happen! “Multi-time W . . . W . . . E! (WWE) TAG! TEAM! CHAMPIONS! The New Day want you to feel the power!! And now you can with The Book of Booty: Shake It. Love It. Never Be It. 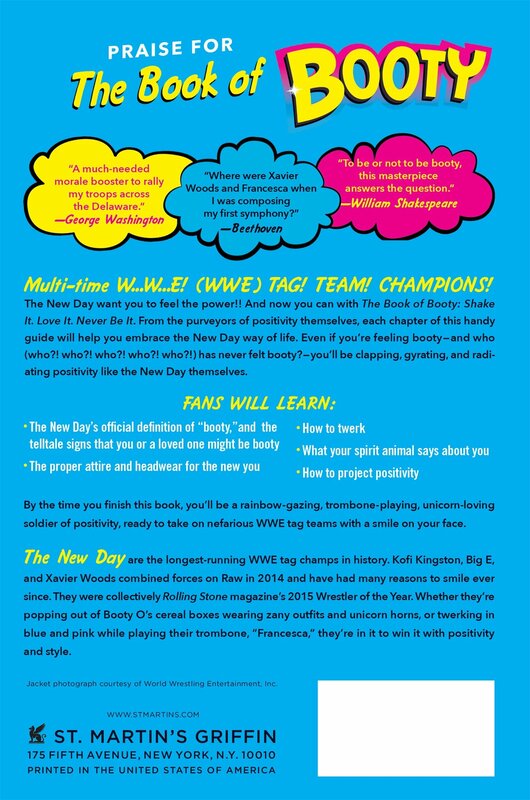 From the purveyors of positivity themselves, each chapter of this handy guide will help you embrace the New Day way of life. Even if you’re feeling booty—and who (who?! who?! who?! who?! who?!) has never felt booty? —you’ll be clapping, gyrating, and radiating positivity like the New Day themselves. The New Day’s book will be released on April 25, 2017, and you can currently pre-order the hardcover or Kindle versions of it at Amazon RIGHT NOW. Also, just so everyone knows, Big Apple Takedown is all types of wonderful and EVERYONE should read it! Real talk, BAYYYYY-BEEEEE!!!! Previous Previous post: Finally, Here’s an Internet Security Basics Course for the Whole Family; Just in Time for the Holidays!